Preheat oven to 180C/350F/gas 4. Put the flour and salt into a mixing bowl. Cut the butter into small pieces and add to the flour, rub in with fingertips until the mixture looks like bread crumbs. Stir in the sugar. Roughly chop the apricots and add to the bowl along with the sultanas. Beat the eggs with the vanilla and milk, add to the bowl and mix with a wooden spoon to make a stiff cake mixture. Spoon one-third of the mixture into the prepared tin and spread evenly. Cut the marzipan into 1.5cm cubes and arrange half on top of the cake mixture. Cover with half of the remaining mixture, spreading it evenly. Arrange the rest of the marzipan cubes on this layer. Spread the rest of the cake mixture on top to evenly fill the tin. Gently bang the tin on the worktop to release any air bubbles. Bake for 1 to 1 1/4 hours or until a skewer comes out clean (it’s best to test in several places, because it’s hard to avoid the marzipan). Transfer to a wire rack and leave to cool for 15 minutes before carefully turning out to cool completely on the wire rack. To finish, carefully heat the apricot jam in a microwave (about 30-45 secs). 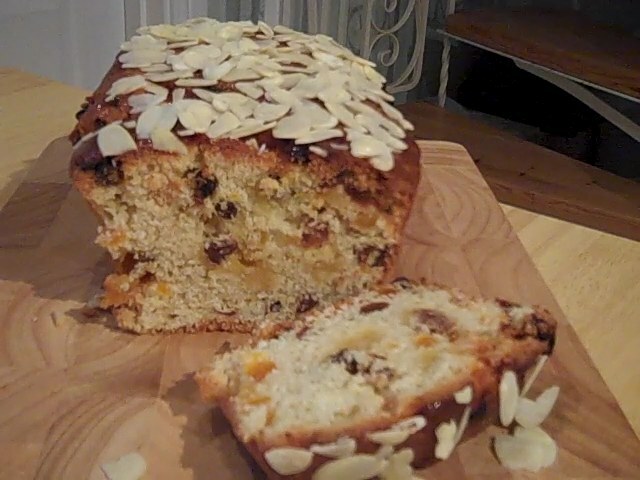 Brush the melted jam over the cake and scatter the flaked almonds all over it. Leave to set.